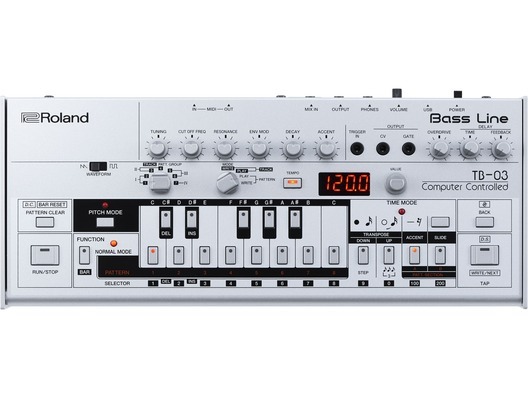 The Roland TB-03 is a compact and portable recreation of the TB-303 Bass Line Synthesizer with the same sound and user interface as the original TB-303. The TB-03 can be USB powered or battery-operated and features its own built-in speaker so you can make music on the move. 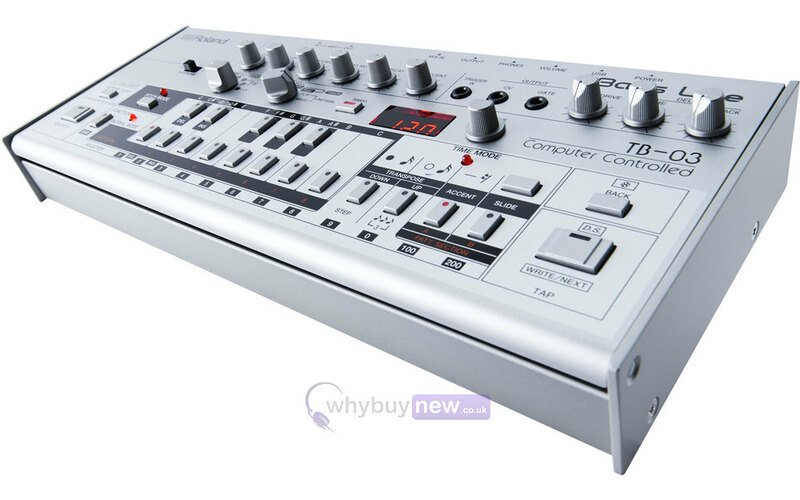 The battery-powered TB-03 is a direct descendant of the famous TB-303 Bass Line Synth. 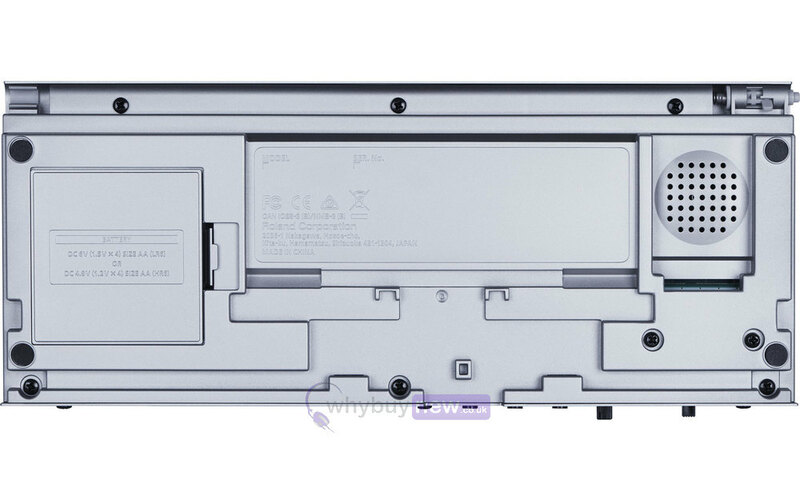 The layout and controls are unchanged, so it works just like the original. 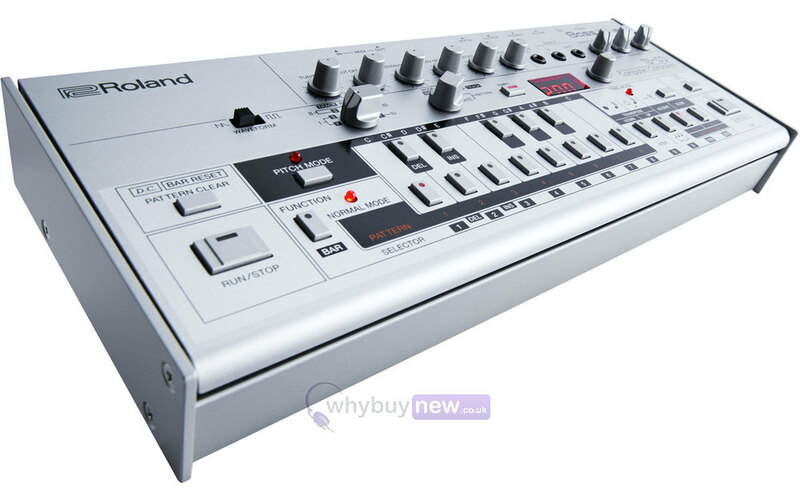 It sounds like it too, thanks to Roland's advanced ACB technology that recreates the hypnotic liquid grooves of the magic silver box. But the new TB-03 goes even further, with several enhancements not found on the original model. The four-digit LED display makes programming easier and more accurate, while overdrive and delay effects let you unleash a twisted, tribal wall of sound to send the crowd into a frenzy. Back in the studio, the TB-03 can send control information via MIDI or its USB port, the latter of which also functions as a 24-bit/96 kHz audio interface. You know when you hear a TB-303-a hypnotic, tribal sound that works best in dark, crowded rooms with big sound systems. Using the same ACB (Analog Circuit Behavior) technology from the acclaimed AIRA series, the TB-03 accurately emulates the expressive, slippery sound of its older brother, and even adds a few surprises. 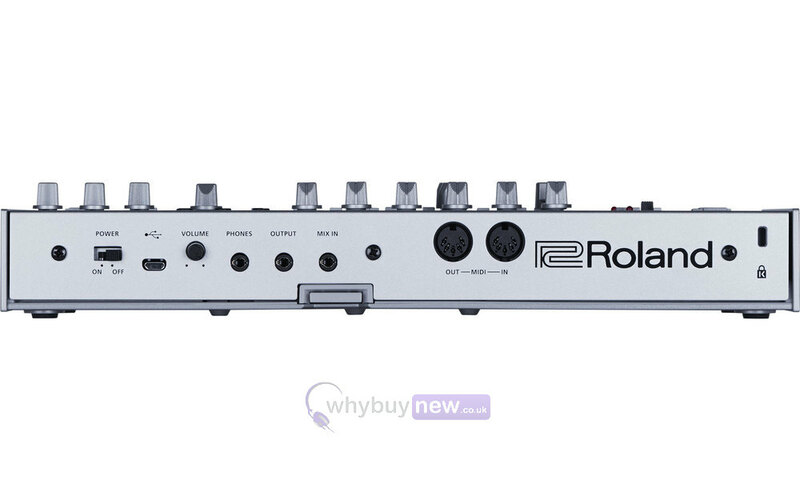 Saw and square waveforms are available, along with all of the rotary control knobs that help shape the 303's unique character, including tuning, cutoff, resonance, envelop mod, decay, and accent. Ordered Friday, received Monday (London) Played all night long with my TB-03 and really enjoyed it ! :) Thanks guys !